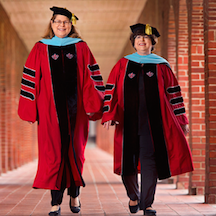 The University of Louisiana at Lafayette recently conferred its first two doctorates in its educational leadership in higher education degree program. Both recipients of the doctoral degrees are employees of the university. Both are in their 60s and they are sisters. Ellen Cook is assistant vice president for academic affairs at the university. She holds a bachelor’s degree in accounting from the University of Louisiana at Lafayette and a master’s degree in accounting from Louisiana State University. Her younger sister, Anita Cook Hazelwood is director of the Health Information Management program at the university. She is also a graduate of the University of Louisiana at Lafayette, where she majored in medical record science. Dr. Hazelwood earned a master of library science degree at Louisiana State University.